Since I'm off this week, but my husband is working, I figured I'd squeeze in some camping (plus I'm sure you're sick of hearing about Pioneer Week). However, since my husband's going to be joining us tonight, we're going to be camping in the backyard. Needless to say, I'll be getting a lot of reading done by lantern. Have you ever stooped to backyard camping? I set up a borrowed tent in the backyard to check how it went together before taking it on a massive road trip from Ohio to South Dakota and back. After that, we bought a tent (actually 2) and road tested them at the campsite in the dark. Yep at our holiday home when people would not share nicely. We like to have friends over for a bonfire and set up tents for all of the boys. Our 2 and our friends 2 sleep in the tents with the daddies, and the mom's and baby sleep extra well inside. It's a nice break. Also we can have camping parties and invite a ton of people to camp here. Most people don't venture to the woods with their tents, but stay right around the fire. So much fun. My charming dad used to set up our old-school giant canvas tent when we were kids so me and my brother and our friends could camp in the back yard. I don't know how we could stand the Texas coast's nighttime heat and humidity, but we loved it! I love backyard camping! It's always a start. My three years old before had his first camping experience in our backyard and it turned out great. 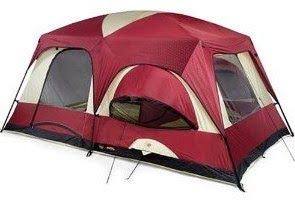 We are now a large family and this tent really looks great. Kinda like a house already and two bedrooms! Wow! I think I'll get a tent like this.